Professionally made, custom dental night guard designed to ease jaw muscle pain and protect your teeth against grinding damage. Get professional quality and save $100's of dollars: order online directly from a professional dental laboratory used by dentists to create night guards. 1) ORDER ONLINE - make your order online and you will receive an easy to use home impression kit in the mail. 2) MOLD - use the easy home impression kit and mold the putty material to take an impression of your teeth. 3) MAIL - mail the impression of your teeth to our dental lab using the pre-paid envelope. Our professional dental lab will custom make a night guard based on your impressions (takes between 6 to 10 business days). Once completed, we'll send you your custom night guard in the mail. We provide all inclusive FREE shipping. All purchases are covered by our 365 DAY 100% MONEY BACK GUARANTEE - No questions asked. Just return the product for a full refund if you're unsatisfied for any reason. We pay for return shipping. 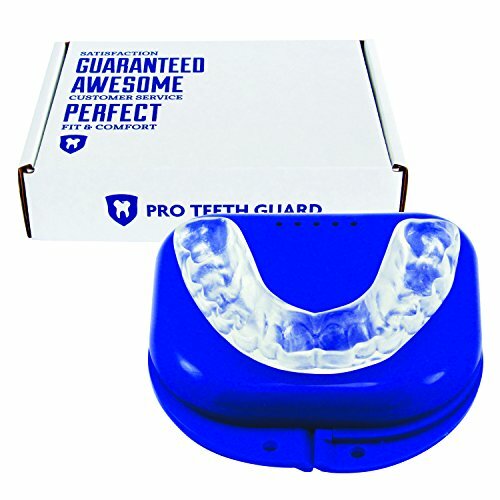 GET PROFESSIONAL QUALITY, SAVE $100's - Get a high quality, professionally made, custom fitted night guard to protect your teeth against grinding. CUSTOM MADE, FITS PERFECTLY - Custom made to cover your teeth perfectly. Use our easy home impression kit, take an impression of your teeth, and send it in with the postage-paid return envelope. We custom fit the dental night guard based on your teeth impressions. If you have any questions about this product by Pro Teeth Guard, contact us by completing and submitting the form below. If you are looking for a specif part number, please include it with your message.